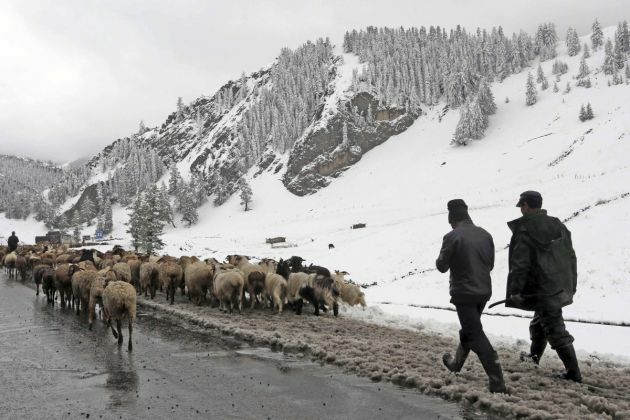 (Photo: REUTERS / Stringer)Herders (R) transfer their goats to a warmer pasturing area after heavy snowfall hit Hami, Xinjiang Uighur Autonomous Region, September 12, 2014. Fifty people died in violence on Sunday in Xinjiang Uighur Autonomous region in northwest China, State media said, in what police called a "serious terrorist attack" after bomb blasts in police stations and government buildings. Violence has intensified in recent months in Xinjiang that is home to the Muslim Uighur minority group. There tensions exist between the Uighur community and the majority Han Chinese, the BBC reported. Tianshan, a regional government's news portal said that blasts occurred around 17:00 on Sunday at two police stations, an outdoor market and a shop entrance. The "rioters" had either blown themselves up or were shot dead by police, it said. Fifty-four civilians were injured and two "rioters" were captured, it said. Earlier it was reported that at least 12 people, including three police officers, had been killed, while around 100 were hurt in attacks launched on government offices and police stations on September 21. Those details emerged from the attack in different parts of Xinjiang. Speaking to U.S.-based Radio Free Asia, witnesses said the casualty count was definitely higher than the initial reports that the regional government released through its web portal. On Monday, authorities in Xinjiang said two people were killed in the bomb attacks that were launched in three areas in Bugur County. The witnesses, who spoke on condition of anonymity fearing reprisal from the government, said the attacks on a city center in Bugur and the towns of Yengisar and Terekbazar left 12 people dead. Seeking to confirm the number of casualties in the attacks, Radio Free Asia spoke to a nurse at Bugur's county hospital. The nurse said the hospital has been crammed with patients who were being treated for serious injuries sustained in the attacks. "I assume there are about 100 people with injuries because all the hospital beds are occupied right now," the nurse said. Some 20 police officers were being treated for the injuries they sustained in the attack, as well as a suspect. The regional government imposed a curfew in the areas where the attack occurred, according to sources in the region. China has blamed Uighur extremists who it says are backed by overseas terror groups for recent incidents. Uighur activists blame oppressive Chinese rule for driving violence and disenchantment in local communities.